Are you a tech-savy transient that somehow wound up on the streets of Austin Texas? There’s an app for that! The webpage is: cleroythomas.github.io, and it’s easy to navigate for those dealing with homeless-related issues. 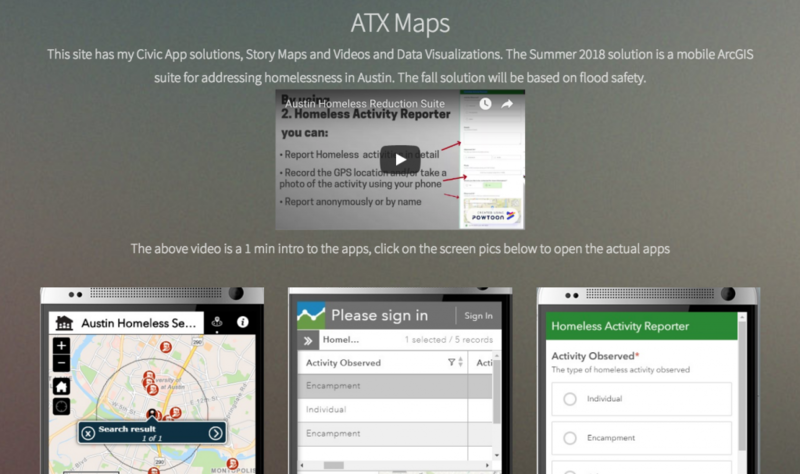 The app is called “Austin Homeless Reduction”, and has 3 parts. The first channel pinpoints on a map that can be zoomed general services throughout the city, including the ARCH, Caritas, and Angel House. The second channel is the Homeless Activity Dashboard which is designed to be a forum for relaying information in groups relevant to homelessness in this city once it is opened (It is still in its start-up phase like the rest of the app). The last channel is the Homeless Activity Reporter. This has an option for volunteers, advocates, and social workers to register onto the site and become part of community updates on homeless-related activity they see. The updates can be relayed in the form of geo-mapping where homeless people are gathering and sharing photos of the homeless people and their outposts for the purpose of organizing the analytical data for the future outcome of designing solutions that meet the needs of the current homeless population in our city. In our short email conversation, Chuck Thomas, the apps creator and developer, seemed excited about the potential this site has to grow. Honestly, I am too. This is the first time I’ve seen anything like this. The direction the open-source format on this app takes will hopefully be positive for the city. Whether it is used to illegally gang stalk the impoverished street people will be yet to be seen. Hopefully not. Thanks for reading!